Hi sweet peas! We are back in Sydney and so happy to be home! Over the next couple of weeks, we'll be sharing a mix of wedding recaps (just waiting on photos and video! ), honeymoon recaps, delicious new recipes and bits and bobs as we do. A lot of you have asked us about flying to Bali - who to fly with, how long the trip is, which airlines are best for those with allergies etc. so I thought I'd share our Point A(ustralia) to Point B(ali) journey with Garuda Indonesia! Our morning started eaaaaaaarly! Our flight departed at 10am so we got to the airport about 7am to make sure we got through on time. 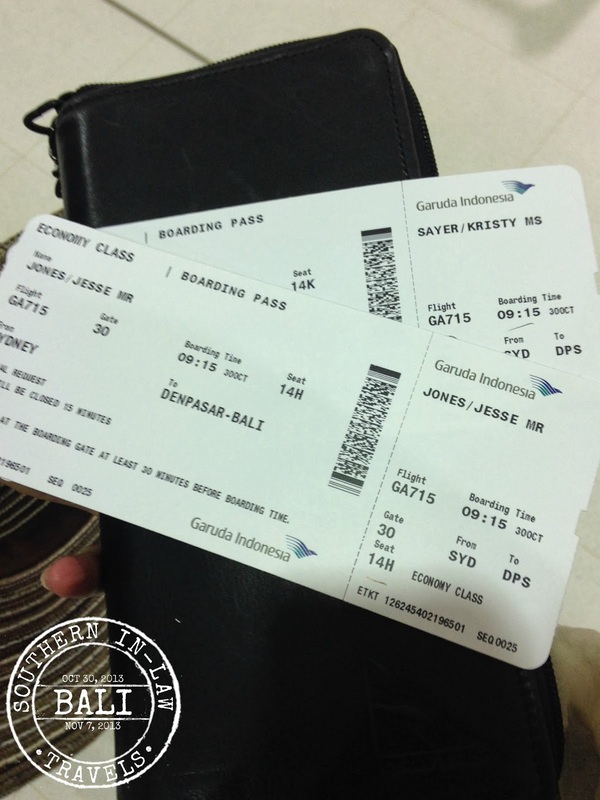 Little did we know, Garuda is a super airline and we were completely checked in within 10 minutes! Usually when we fly QANTAS, we stand in the check in queue for at least half an hour - so our waiting time was a breeze and that 10 minutes even included our Bali Visa on Arrival Tax. To fly into Bali, you have to pay an arrival tax ($AUD26 per person). Garuda is the only airline which allows you to bypass all of the immigration queues at Denpasar Airport by offering in-flight immigration. 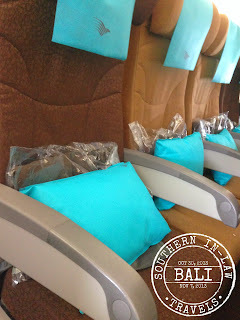 The Garuda Immigration on Board Service was an absolute breeze. 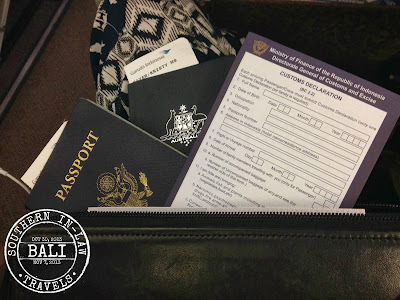 You pay your arrival tax at the Garuda counter before leaving Sydney and after your meal is served on the plane, you're given the immigration documents to fill out. A little while later, an Immigration officer comes through the plane, checks your documents, stamps your passport and hands you a card which allows you to bypass immigration at the airport when you arrive. This saved us a tonne of time. Denpasar Airport is known for being slow with passengers waiting up to a couple of hours just to get out after arriving. We were in and out of the airport within 30 minutes from getting off the plane - and that included riding in a bus to the terminal. Our Number One Airport Tip! With me having so many allergies, we always have food to declare - but whilst you'd think declaring takes longer, it's almost always the shortest line. Just make sure you food items are safe to bring into the country - we bring all packaged food so we're usually cleared within seconds. At Denpasar Airport we queued in a line with one family in front of us, whilst the nothing to declare line was fulllllll and winding around and around. I'll share more of what we packed in another post, so don't worry! But back to the plane! Garuda recently named the World's Best Economy Class by SkyTrax at Paris Airshow and it is actually pretty nice. The seats themselves aren't overly comfortable, but the pillow and blankets you're given make everything so much more comfortable. On the back of each seat is an entertainment system which has music, games, movies and TV shows. We watched 3 movies during our 6 and a bit hour flight (And you can kind of tell we're kids at heart when Turbo is playing on the screen ;P) and it helped the time to pass by really quickly. There's a selection of movies from new releases to old favourites as well as current and old TV series, radio channels, a wide variety of music albums and a selection of games. It's both touch screen and remote controlled so you can choose whichever works best for you. Now, as far as food goes, Garuda is definitely allergy aware. I called up a few days before our flight to request a gluten free meal so this is what you see above. 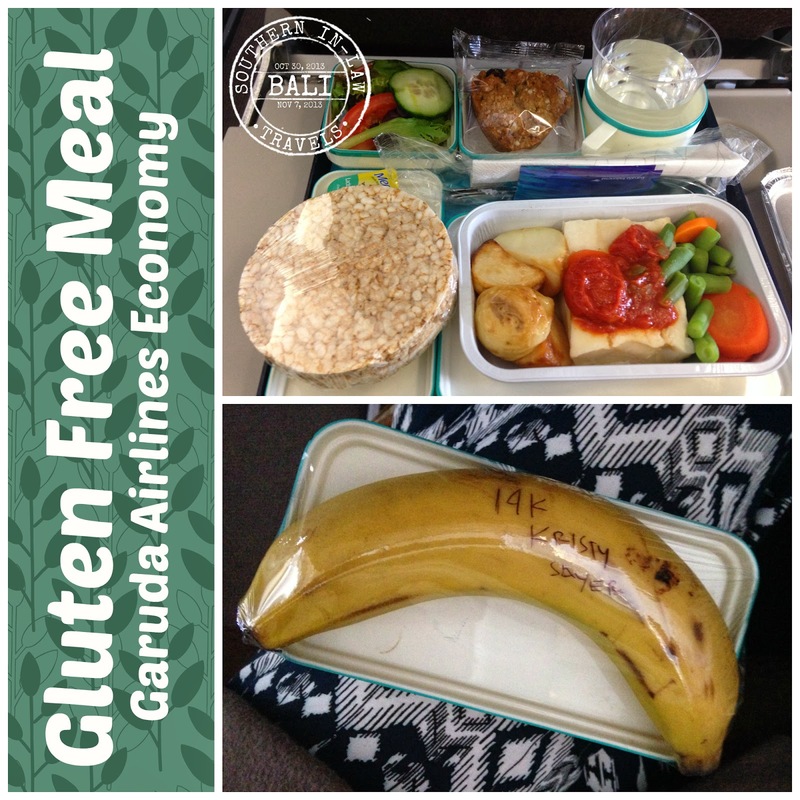 Most airlines these days offer a full gluten free meal, however, some airlines offer "Low Gluten Meals" so you have to be careful (I know Japan Airlines is one who does this). 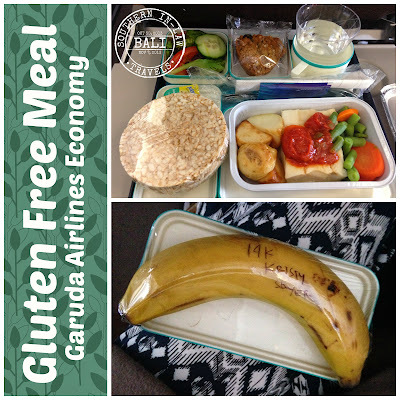 Most Airlines which offer Gluten Free Meals combine their Gluten Free/Dairy Free meal so that's why you'll find non-dairy margarine and non dairy milk in your meal. This is a bit of a pain for those who are soy intolerant (as any baked goods or meals often use soy milk). 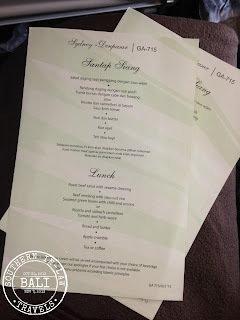 The Gluten Free Meal for our flight leaving Sydney to Bali (GA715) included; a garden salad with lemon vinaigrette dressing, a Rowie's Cakes Cranberry and Apricot Brekkie Bite, Rice Cakes with Non-Dairy Margarine and what I'm guessing was Steamed Fish with Potatoes and Steamed Carrots and Green Beans. After lunch they also served icecream, however, for the gluten free-ers the snack was a banana. Obviously this allergic to everything girl didn't have much luck in the food department (this is why I always pack my own meals) but Jesse happily ate the rice cakes and potatoes and I ate the banana. Jesse had the Regular Economy Meal for our Garuda Flight. 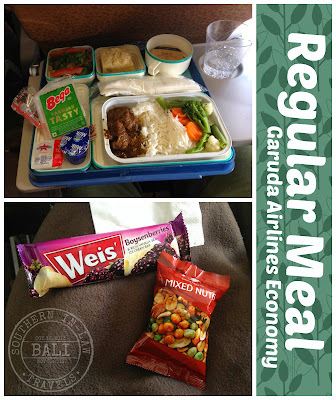 Garuda offers a choice of two different meals for every meal and for this flight it was a roast beef salad with bread and butter and an apple crumble with a choice of either the beef rendang with steamed rice and sauteed green beans with chilli and onions or the ricotta and spinach cannelloni with a tomato and herb sauce. Jesse went for the beef rendang which he said was actually pretty good for plane food - and decided to grab my Brekkie Bite for dessert instead of the Apple Crumble (which he absolutely loved - GF win!). Before landing they served icecream and some mixed nuts. Weiss Bars are gluten free, I'm guessing they chose the banana for GF guests as the gluten free meal is also their dairy free meal. Flying Home was a bit of a nightmare. The Ngurah Rai Airport is in the process of being re-done so everything's a little bit crazy. Once you arrive at the airport you have to go through security and they'll x-ray your bags and give you a sticker to say that you've cleared security. Make sure you get the sticker or otherwise you'll try to check in and find that you've got to go all the way back to the beginning and start over again. Once you've been through the X-ray process, you have to wait to check in with your airline. Once your bags are all checked through, you then have to head over to the Departure Tax area where you pay your departure tax (Rp $300,000 per person - in cash) and then head through to immigration where they check your passports etc. Make sure you keep your departure card which you'll get when you arrive (or on the plane if you're flying Garuda) as without it, you're in trouble. Once you've passed through immigration you then walk through the Duty Free area and into the terminals where you'll find you have to sit and wait to find out what gate your flight will leave from. We sat on the floor of the airport for 1 1/2 hours waiting to find out where we'd be leaving from as there is no where to sit. At first, I was being my usual self and crouching down and not actually sitting on the floor (totally gross) but in the end I gave up and sat down on the dirty floor. As you fly out at nighttime it's awful - you're tired, ready to sleep and you probably have little patience. The flight itself wasn't good at all - but that's the beauty of a night flight. We got about an hour and a half sleep as that was the only time they didn't have the lights on full brightness. Garuda also make really loud announcements for breakfast/turbulence etc so that didn't help. Once we got home (at around 7:30am) we were absolutely exhausted and fought to stay awake all day - giving in to take a nap at around 3pm and then sleeping for almost 12 hours that night. Needless to say, it was sooooooo amazing to finally be home. Vacations are great, but home is so much better. Would we fly Garuda again? Definitely! The service was great and the Immigration on Board service made flying into Denpasar Airport an absolute breeze. At the moment, no other airline offers this service, so it's well worth booking with Garuda. In fact, after seeing the lines for immigration there's no way I'd be flying with anyone else but Garuda. It's also great that it's a direct flight - no going to Singapore and switching flights and wasting time. How much were our tickets? 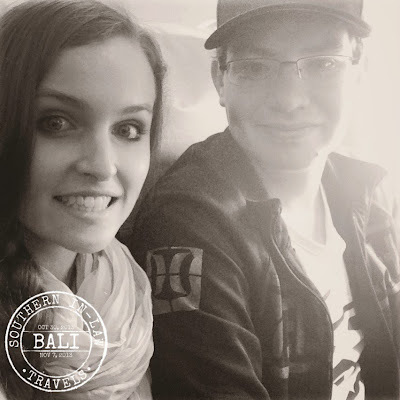 We paid just under $1300 for the two of us to fly Economy from Sydney to Bali with Garuda. This is because we found out about their Spring Specials and booked them during the sales. The best way to find out about Garuda's Sales is to check their website Special Offer section - and also to call their reservations line and ask if they have any special offers on at the moment. Is Garuda SIL Approved? Yes! But tell me, what are your travel tips? As well as declaring something to get through the airport quicker, we always like to take a passport wallet to keep all of our travel papers and details safe and secure and we also make sure we take along our own headphones as airline headlines are usually bad.